Bingo at Majestic Amusement Arcade & Bingo01493 843525work BingoMajestic Amusements has a great range of arcade games with something to suit everyone and several new additions for 2018. Majestic Amusements has a great range of arcade games with something to suit everyone and several new additions for 2018. Majestic Bingo is the ONE AND ONLY prize bingo on the Great Yarmouth seafront with a fabulous new range of prizes for 2018 but still at the same price of play: JUST 10 PENCE FOR TWO CARDS, 20 PENCE FOR THREE CARDS AND 30 PENCE TO PLAY ALL FOUR CARDS. On arrival in Great Yarmouth follow signs for the Seafront, taking a right turn at the mini roundabout onto Marine Parade. 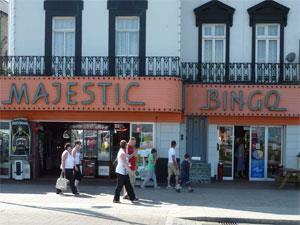 Majestic Amusement Arcade is located a short distance along Marine Parade, adjacent to The Empire.